This is a 62 set up with a stop but is a Bigsby/studs version. Note the brown case-last year for those too. 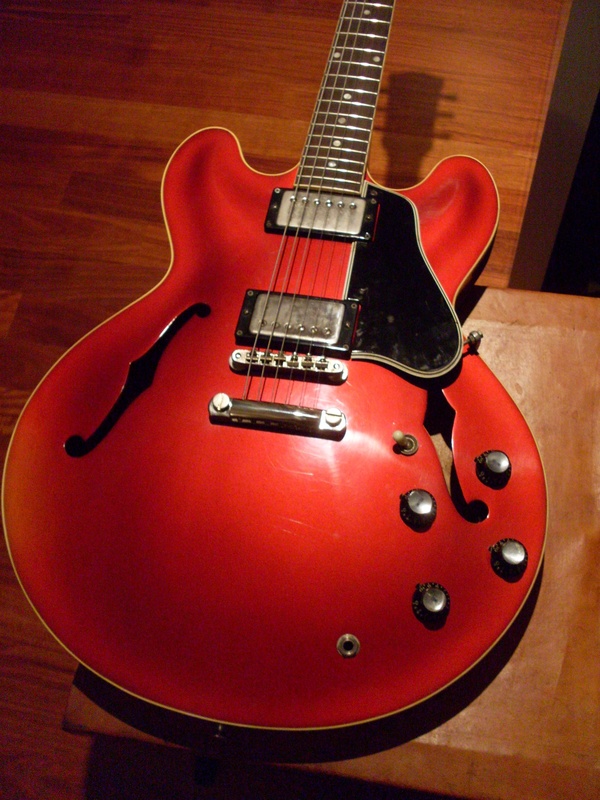 I thought I had done this already and went through the old posts and somehow I never did a post looking specifically at the 62 model year for the ES-335. And it’s a pretty interesting one because it was the year that Gibson switched from dot neck to block neck. Most folks assume that 61’s are dots and 62’s are blocks. Au contraire. Gibson made the transition to the block neck during 1962 probably in the Spring. I’ve never seen a stat that says how many dot necks and how many block necks were shipped but based on what I’ve seen in the real world, it’s got to be perhaps 8 blocks to every dot. They made nearly 900 335s that year and it was the first year that cherry was the more popular color (by more than 2:1). What’s really odd is that I’ve only had one red 62 block and I’ve had a least 8 or 9 62 block necks. I have two more I’m buying and they are both sunburst as well. I have no explanation. Of course, 62 is also the year Gibson started phasing in the patent number pickup. Most of you know that the early patent and the late PAF are identical. Only the sticker is different but that doesn’t stop folks (including me) from charging a $1000 to $2000 premium for that sticker. Nobody ever said that collectors were sensible. A couple of other things occurred during 62 as well-although I’m going to get an argument from someone on this because it isn’t entirely clear. The saddles changed to nylon. “Hold it”, you say…”the saddles changed in 61-I know because my SG has them”. And you would be right but they didn’t change on 335’s until 62. In fact of the 8 or 9 62’s I’ve had and quite a number of others I’ve seen, most of them still show metal saddles. The other change during 62 was from the no wire ABR-1 to the wire version. This is trickier to figure out because alot of people swapped out their no wire bridge for the wire type for the simple reason that they got tired of chasing their saddles around the bandstand every time they broke a string. It seems to me that most are no wire and that the transition occurred late in the year. Lastly, 62 was pretty much the last year for the brown case. Although I’ve had a 63 SG in a brown case, I haven’t had a 63 335 in one. That doesn’t mean they aren’t out there. As I’ve mentioned aboout 100 times, the cases were often supplied by the music store and if they had a brown one kicking around the back room in 63, they wouldn’t hesitate to put a 63 335 in it. 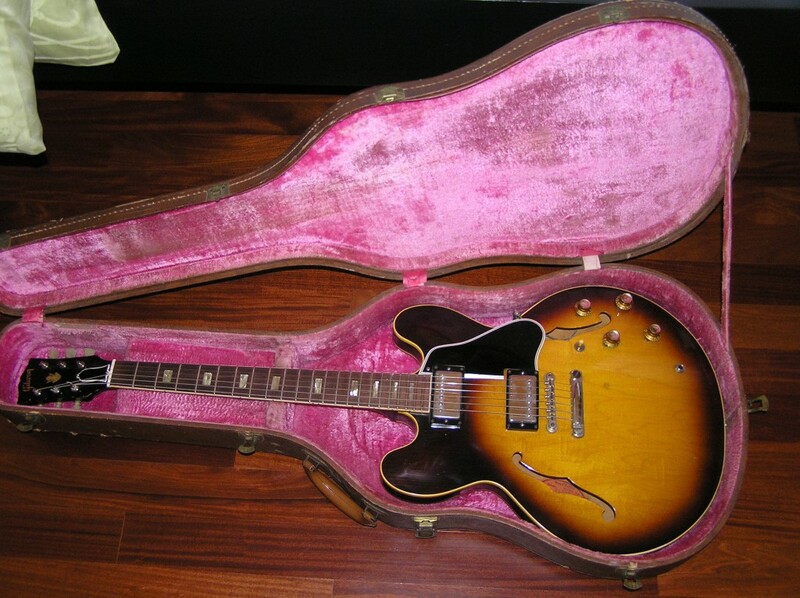 The 1962 is a fairly popular year for players and collectors because it is usually the least expensive “Golden Era” 335. Surprised? It has to do with the neck profile more than anything. While it is the same (more or less) as a 60 (except the earliest ones) and a 61, the 62 block isn’t a dot neck so it isn’t worth as much. OK, why is it worth less than a 63…after all it’s more likely to have 2 PAFs, right? That’s true but many 63’s have the big 64 size neck which to many buyers trumps a PAF. I would say a 62 and an early 63 are the “bargains” of the era. Stop tails in great shape should be from $15K-$18K depending on the condition. Don’t go looking on Ebay-the dreamers have them as high as $32,000 and be careful on Gbase as well. There are 62/63s for as high as $25K. The average among the dealers in still over $20K but those guitars aren’t flying out the door-some have been listed for 3 years now. A Bigsby or Maestro version will be thousands less. You should be able to find one for as little as $10,000 but it’ll probably be a Maestro. Make sure the string break angle isn’t too shallow. It will cause big string benders all kinds of problems because the strings will fly right out of the saddles. From a tone standpoint, most are excellent. These are extremely consistent and well built. If you can deal with the slim (front to back) neck, you can save a lot of money and have a guitar that be the equal of almost anything out there. The best guitar I owned this year from a tone standpoint was a 62 (but it was a dot neck). OK, it's the wrong red and it's refinished but it's still a 62 dot neck and it's still the best one I had all year.